The Honda Civic is dull and cheap no more. 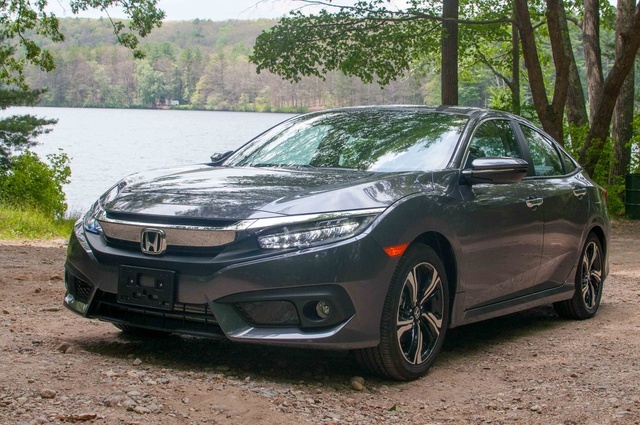 Through each of its nine previous generations, the Honda Civic has upheld thrift and dependability in a very small, fun-to-drive package. The all-new 2016 Civic takes bold chances in elevating small-car fashion, refinement, and build quality. And it succeeds. In the past, the coolest Civics were restricted to Europe, where three-door hatchbacks have been practically modern art in the automotive world. The last few years of Civic models in the U.S. had been humdrum, even after Honda rushed to overhaul the car in 2013—just one year after the new 2012 car debuted—after unusually sharp criticism over its diminished interior materials and overall workmanship. The new Civic sedan is 2.9 inches longer, its wheels stretched 1.2 inches further apart, and those numbers are as dramatic as its silky silhouette. 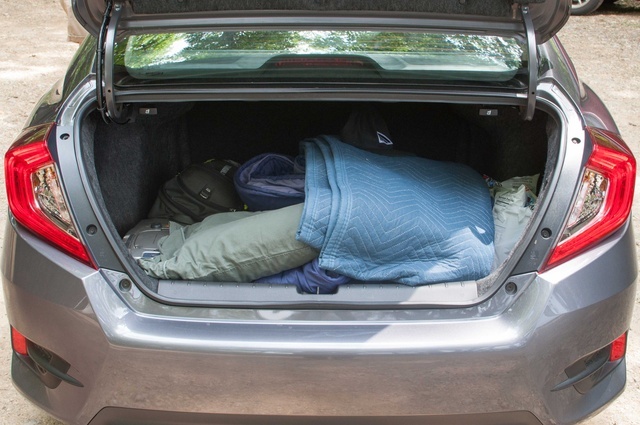 It appears to be a four-door hatchback in the vein of an Audi A7, yet there’s a regular trunk. Yes, the Civic can be compared to a $70,000 Audi because it’s all dressed up and remarkably attractive, sort of like the quiet, skinny high-school classmate who’s suddenly hot, ripped, and making big money. Where did this come from? In either sedan or coupe form, the Civic is sharp. Our top-level Touring sedan flashed chrome on the door handles and roofline, sported polished two-tone 17-inch wheels, lit up the road with full LED lighting (including those spacey taillamps), and generally aced the European sport sedan formula. Inside, the two-tiered instrument cluster has been axed for a cleaner, edgier pod of gauges. Soft-touch rubbers line the dash, no longer broken up into hard, brittle plastic parts prone to rattling. Enough hard plastic remains because the Civic starts under $20,000, but the clean-cut presentation of tight panel fits, contrast stitching, and aluminum-look trim makes this car feel expensive, which it isn’t. I usually surprise my father’s engineering colleagues by showing up to his office with exotic cars. What does it say when these same engineers want to see a new Civic? Two new 4-cylinders replace the previous 1.8-liter engine. A 2.0-liter four with 158 horsepower and 138 pound-feet of torque is standard on the bottom two trims (LX and EX for the sedan; LX and LX-P for the coupe). The next three trims (EX and Touring) get a turbocharged 1.5-liter four with 174 hp and 162 lb-ft of torque. A 6-speed manual transmission is standard and restricted to the base LX. All other Civic trims have a continuously variable transmission (CVT) but no paddle shifters or manual mode. Like every compact sedan save for Subaru, front-wheel drive (FWD) is the only propulsion choice. The 1.5-liter turbo delivers full torque from just 1,700 rpm, and power delivery is linear and strong for its size. 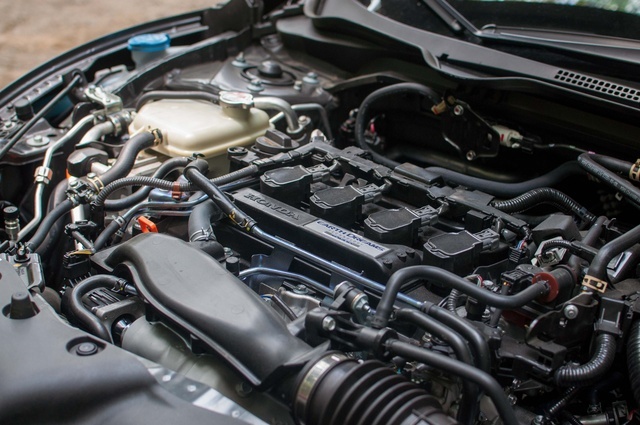 A quick stab of the throttle can catch the turbo off guard, but after it spools up, the CVT keeps the engine revs down so the driver experiences a moving, swiftly accelerating vehicle, not a frenetic juice blender switched to max. Handling is on point, with direct, lightweight steering and a compliant suspension that’s well balanced between tempering body roll and allowing ample wheel travel. 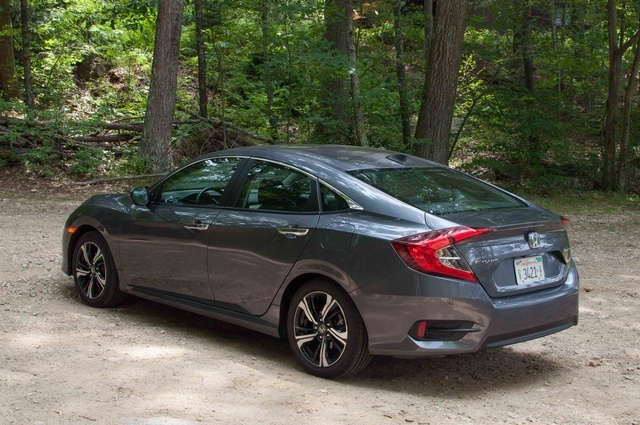 On back roads, the Civic felt alive and eager to play, the brake pedal again a master’s blend of smooth initial travel that transitions into a firm, progressive bite of all four discs. Enthusiasts will want to wait for the higher-revving, 200-plus horsepower Si to return or save up for the limited-edition Type R. As with its other competitors in the high $20,000 range, our Touring trim delivered a surprising silence on the road that made our weekend camping trip to Rhode Island an absolute breeze. The EPA rates the CVT-equipped models at 31 mpg city and 42 highway (the manual LX gets a slightly lower 27/40). Over 300 miles, we averaged close to 37 mpg. Simple, legible controls and instrumentation pervade the interior, except the HondaLink infotainment system controls some of the climate functions. Radio knobs and hard buttons to switch between navigation, audio, and vehicle settings are also missing on the center stack. A touch-sensitive portion to the left of the screen handles these tasks, but they wash out in sunlight and smudge with the rest of the screen. They provide no tactile feedback, either, which is a major oversight. Steering-wheel controls take much of this slack, but Honda could afford to stamp out a couple extra switches and buttons so the driver and passenger don’t need to second-guess themselves every time they want to lower the volume or adjust the fan direction of the air conditioning. Cubbies and storage are abundant and well-placed, including a secondary tray hidden behind the center stack and a central sliding armrest with a sliding coin tray. Visibility is also excellent thanks to thin pillars and a low beltline, something Honda absolutely nails in all of its sedans. You can use the standard backup camera, but unlike some cars, you won’t ever feel you need it. Lighting with our car’s bi-LED headlamps was the best we’ve seen in a small car and better even than many luxury cars costing twice as much that still come with halogens. 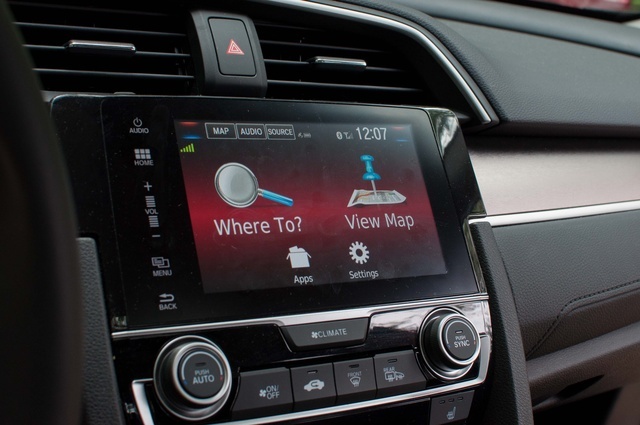 There’s plenty of nerdy customization tricks inside the Civic’s Android-based infotainment system. Dig in, and you’ll find a second interface “skin” that completely changes the look into something resembling Windows 10, with reconfigurable, multiple-size tiles. Change the background image to display an animated black hole or your cute puppy? How about making the temperature readout automatically compensate a couple degrees to match your Weather Channel app? Turn off the tachometer? Needless to say, you can do all of these things in the Civic and way, way more if you wade through all the menus. The system itself is quick, and the Garmin navigation is even quicker, with single-string voice inputs for addresses, live traffic, and pinch-to-zoom capability. Some settings such as adjusting the stereo’s bass are too buried. And while our Civic was all about that bass, Honda put no thought into how the 450-watt 10-speaker stereo would actually sound. The subwoofer rattles the rear shelf and window glass like a cheap aftermarket unit, because there’s no insulation fitted by the woofer (really, we couldn’t have just a little foam for $10?). Even with HD Radio, SiriusXM, Bluetooth streaming, and other app connectivity like Pandora, Aha, Apple CarPlay, and Android Audio, the stereo quality disappoints. But the Civic’s electronics are mostly spot on. Honda’s LaneWatch system is so startlingly simple you’ll wonder why no other car manufacturer offers it. A camera mounted to the right side-view mirror displays the vehicle’s blind spot as a video feed whenever the driver activates the turn signal, and there are even lines denoting car lengths for safe passing. The Touring version’s digital instrument panel can be customized to show all types of scrolling information, such as phone, audio, trip, navigation, and other functions accessible directly from the steering wheel. The volume control clicks up and down but also offers swiping—a downward flick of your thumb mutes the stereo. This is simple, smart stuff. It’s all top scores across the board. The National Highway Traffic Safety Administration (NHTSA) rates the 2016 Civic sedan at 5 stars for frontal crash, side crash, and rollover risk. The Insurance Institute for Highway Safety awarded the Civic sedan and coupe as a Top Safety Pick+, with the best Good scores in all five crash tests plus the best Superior rating for crash avoidance. 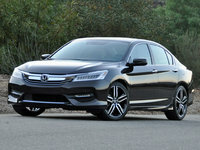 Our car had the optional Honda Sensing package, which includes forward-collision alert, auto braking, lane-departure warning, lane-keep assist, and adaptive cruise control. 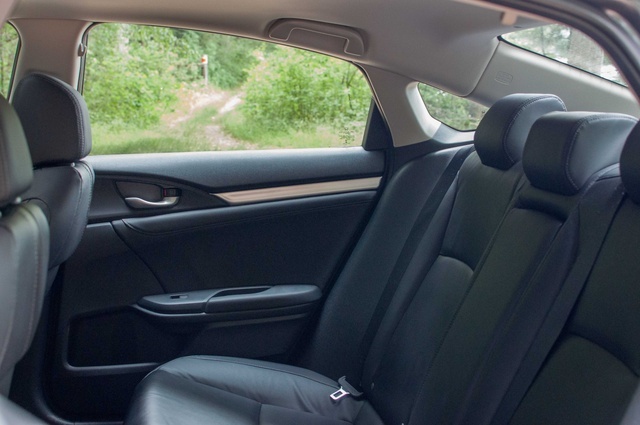 It’s available on every sedan trim, which means you can get all of these safety and convenience features for just 20 grand without spending thousands on unnecessary equipment (for the coupe, it’s only on the Touring). No other car offers these features at such a low price. Used as a semi-autonomous driving assist, Honda Sensing reduces stress in traffic, but can’t read nearly as many things as an actual human. You should never trust these systems implicitly. The backup camera also offers three views, including a top view and an extra-wide shot. On the sedan, five trim levels (LX, EX, EX-T, EX-L, Touring) range from $19,475 to $27,335 including destination. Our car carried that highest price. The coupe (LX, LX-P, EX-T, EX-L, Touring) ranges from $19,885 to $26,960. If that sounds expensive, well, compact cars don’t cost $15,000 anymore. That’s what subcompact cars compete against, and the Civic is so much more refined and full of upscale features that its price is well-justified not just as a Honda, but among competition like the all-new Chevrolet Cruze and Hyundai Elantra. (Don’t even bother with the Toyota Corolla—it feels ancient by comparison.) Honda’s hit most of our buttons with this Civic. 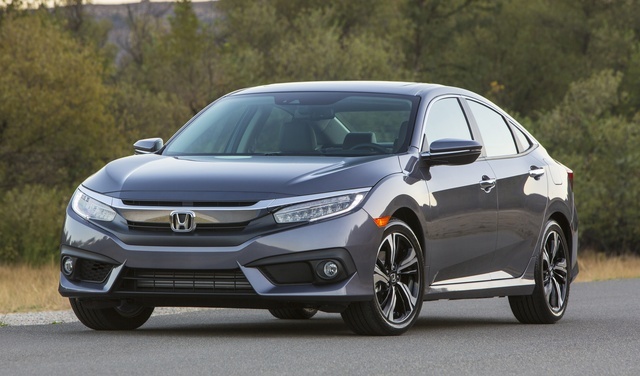 What's your take on the 2016 Honda Civic? Users ranked 2016 Honda Civic against other cars which they drove/owned. Each ranking was based on 9 categories. Here is the summary of top rankings. Have you driven a 2016 Honda Civic? Can I Recover An Older Ad?